On Film Day, creative professionals and businesses that provide support and services for motion picture production will convene in Olympia to show their support for the Motion Picture Competitiveness Program (MPCP) and Washington’s film industry. And with 1 in every 5 legislators being newly elected, it’s important that these newly elected Senators and Representatives hear from our industry! July 20th marked the last day of the 2017 Washington State Legislature’s 30-day special session. 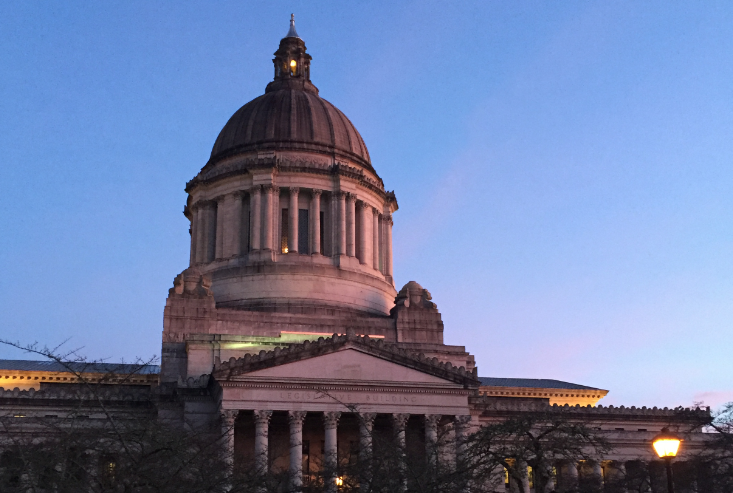 With elected officials returning home to their districts, this edition of Behind the Olympia Curtain marks the last update from the Keep Film in WA campaign for the 2017 Legislative Session. After years of effort in Olympia and around the state, the Keep Film in WA campaign finally secured an unequivocal and momentous victory early this month, when the House and Senate passed a tax preference package that included a 10-year extension for the Motion Picture Competitiveness Program (MPCP). Whether the renewal of the MPCP would be included in the final operating budget, and, if it was, the duration of the renewal, both remained up in the air as late as June 30. The legislation that finally emerged late that night, which provides for the continued existence of the State Film Incentive and State Film Office through 2027, represents a solid foundation to build on in the years to come. On Friday July 7, members of the film community from across Washington piled into Governor Inslee’s office for the signing of the bill. Even after the official announcement on June 30 that the 10-year renewal would be included in the budget, there remained a measure of relief that could only be granted by the Governor’s pen. For more photos from Olympia, please see our blog post about the event. Still basking in the afterglow of the hard-fought victory, we’ve been hitting the road to commemorate the renewal with friends around the state. On Thursday July 20, we convened with the Seattle film community at Saint John’s on Capitol Hill. Just a couple months earlier we’d all been in this same room, raising a glass despite the uncertainty of the coming first special session. Now, with the three special sessions behind us and our legislation in the books, the added sense of relief was palpable. After our Seattle event, we travelled to Spokane, where the always enthusiastic community welcomed special guest Representative Marcus Riccelli (3, D), a prime sponsor and tireless advocate of the renewal bill. Also in the room was former State Senator Lisa Brown, one member of the legislative leadership team that helped launch the program during the 2006 legislative session. For more photos from our events in Spokane and Seattle, check out our Facebook album. On August 8, Washington Filmworks Executive Director Amy Lillard will be a guest at Bellingham Film’s bimonthly mixer. Amy will be discussing the passage of the renewal and give a preview of where we go from here. We’d love to see you there! Now that our 2017 legislative campaign is firmly behind us, it’s a great time to follow up with elected officials. 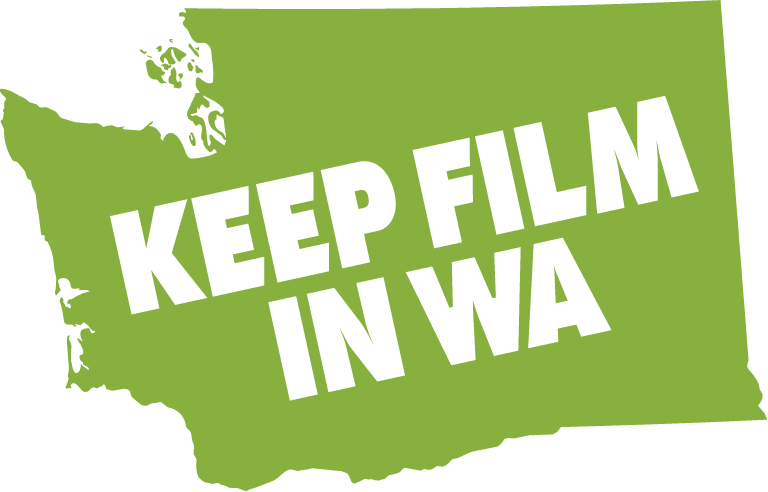 If you were in touch with your Senator or Representatives during this long legislative session, don’t forget to reach out to them with a message of thanks and let them know how much their support is appreciated by the Washington State film community. You’ve probably heard by now that last Friday, Governor Inslee signed the bill renewing the Motion Picture Competitiveness Program for a full 10 years. By any measure, this is a huge success for our campaign. The advocacy efforts of the statewide film industry have been the lifeblood of this campaign, and this moment represents the culmination of years of hard work and dedication. Whether it was showing up for Film Day (this year… last year… the year before that… or maybe all three), sharing your story in our Faces of Film campaign, writing a letter to your local newspaper, or calling your state legislators, it was through your collective efforts that this legislation became law. It’s your unwavering support and persistence that made everything possible… and now it’s time to CELEBRATE!! Please join us for one of our three celebratory events in Seattle, Spokane, and Bellingham. There will be food and libations-and at least a toast or two! So come raise a glass with us to celebrate our past, our present, and the next 10 years. The bill to renew the Motion Picture Competitiveness Program (which passed the House and Senate as part of a tax preference package on Friday, June 30th) will be signed into law by Governor Jay Inslee on Friday, July 7th at 1:30 pm. The bill maintains the program at its current level and renews the Motion Picture Competitiveness Program for 10 years (until July 1, 2027). The bill to renew the program would never have passed if it was not for the unwavering support of creative professionals across the state. Please consider joining us on Friday, July 7th for the bill signing ceremony so that we can celebrate our collective success! If you are interested in attending, please email Washington Filmworks Executive Director Amy Lillard (Amy@WashingtonFilmworks.org) and let her know you plan to attend. Once we receive your RSVP, we will send out detailed information about where to be and when. Please consider joining us for this momentous occasion. We would love to see you there! Late Friday evening and into the early hours of Saturday morning, the Senate and House passed a tax preference bill that included the Motion Picture Competitiveness Program (MPCP). We are thrilled to report that the MPCP has been extended an additional ten years until July 1, 2027. There was also an administrative change in the program, reducing the amount of the Business and Occupation tax credit one business may claim from $1 million annually to $750,000. The bill passed the Senate with a vote of 33 yeas to 16 nays. The House passed the bill with a vote of 83 yeas to 10 nays (with 5 excused). While the bill has passed both the House and Senate, it still needs to be signed into law by Governor Jay Inslee. Once the bill signing has been scheduled, we will let you know. Thank you to our prime sponsors, Representative Marcus Riccelli (3, D) and Senator Randi Becker (2, R) for their unrelenting support as well as our additional House and Senate sponsors. If your legislator was a sponsor or supporter please call or write them to express your thanks. What do you do? Briefly describe your work? I do casting for feature films, television, new media, and commercials with offices in both Seattle and Los Angeles. My team and I collaborate frequently with local Seattle filmmakers including Megan Griffiths, Lynn Shelton, Mel Eslyn, Jennessa West, and Lacey Leavitt. Our goal is to find fresh, new, talented faces, even outside the typical acting community. We are also proud to do casting for tons of commercials that shoot in Washington, everything from car ads to Washington Lotto to Seattle Seahawks (GO HAWKS!) related projects. Why is Washington State a great place to film? Washington is a great place to film because it is a big family of workers. Someone who is a PA on one film may be an actor on another, or even direct his or her own short film. Everyone knows everyone, making it feel like a small town rather than a statewide industry. We all work together to grow our individual careers, as well as the community. This city and state is full of great talent. Some are already embedded in the film community, while others come from the stage. It’s exciting to bring amazing talent to producers and be able to say, “Yes, they live in Washington!” I love making the call to someone who is just starting out to tell them that they booked their first job. We typically aren’t on set, unless we come for a visit. The majority of our work is done in pre-production where we work with producers, writers, and directors. You can’t start shooting without a human body in place to say the lines. We tend to be one of the first to read a script which makes us an integral part of forming the characters and the overall creative direction. We translate the director’s vision into a character that someone can embody. Our initial process is to come up with lists of actors who could fit the part. We also have auditions to find the right talent for the role. Our outreach is not just limited to agents but is influenced by theater, improv, or just someone on the street. We are always pushing unseen talent that could turn into new discoveries. One major feature my associates and I cast locally was Captain Fantastic. Without the incentive program in place, I’m not sure the production would have been able to shoot here. If you’ve seen the movie you know that the landscape of Washington State almost becomes another character. That movie went on to play at 2016 Sundance, Cannes and Seattle Film Festivals, and it was nominated for several awards including the Academy Award for Best Actor for Viggo Mortenson. My company was even nominated by the Casting Society of America for Casting. What kind of financial benefits have you seen or experienced from the incentive in your greater community? The Seattle film community is lead by several strong female voices, and without the incentive, their projects may not get made which is needed now more than ever. I can’t think of another film community that has as many Wonder Women. Through Amey René Casting, I have been fortunate enough to provide full time employment for two people, part time work for many others, and an internship program that fosters our next crop of filmmakers. We pride ourselves on making the community more prepared by doing classes, giving feedback, preparing them not only for the current audition but the next one as well. Our talent needs to be ready for when the big jobs to come to us. Without incentive sponsored opportunities to flex the acting muscle, our talent is going to be stilted and not able to compete with larger markets that work all the time. Describe your work: I am a filmmaker. I got my start in special effects makeup and shortly thereafter expanded to screenwriting, producing, directing, shooting, and editing. The diversity of ecological landscapes in Washington is astounding. The natural environment would meet the needs of almost any production. This is a great asset for local filmmakers that could also be leveraged to bring out-of-state productions to Washington. Further, the creative culture of Washington is unlike any other. Musical and technological giants have made their homes here and greater support for the film industry could propagate a similarly world-class filmmaking community here as well. Producing a film requires a broad range of skills and extensive collaboration. It is thrilling to meet the complex challenge of realizing a single artistic vision through the combined sweat and creative camaraderie of a dedicated crew. The presence and strength of the incentive program will determine the resources that are available to me (and all other local industry professionals) to produce content and hire in-state. This will be vitally important to me moving forward, as I am establishing a film company, Index Pictures, in collaboration with three Tacoma-based colleagues. We are currently developing our first project, a feature-length film. This is also the first Washington-based project that I am producing. The Washington film industry has the potential to be much more economically fruitful than it currently is. For example, Georgia’s film and television industry, which is supported by a strong state-level tax incentive structure, infused $6 billion into the economy in FY 2015. An important first step toward expanding how film serves Washington is to keep existing support for film production and renew the Motion Picture Competitiveness Program (MPCP) in 2017. In the future, I would like to see better tax incentives and opportunities for growing independent film companies that use smaller grants to make high-impact films. If the incentive program is not maintained, that could severely hamper my ability to produce local films. It may mean relocating to a state with a stronger incentive program.